bNeurosurgery (G.N.B. ), St. Elisabeth Ziekenhuis, Tilburg, the Netherlands. BACKGROUND AND PURPOSE: Patients with fusiform basilar trunk aneurysms have a poor prognosis. Reconstructive endovascular therapy is possible with modern devices. 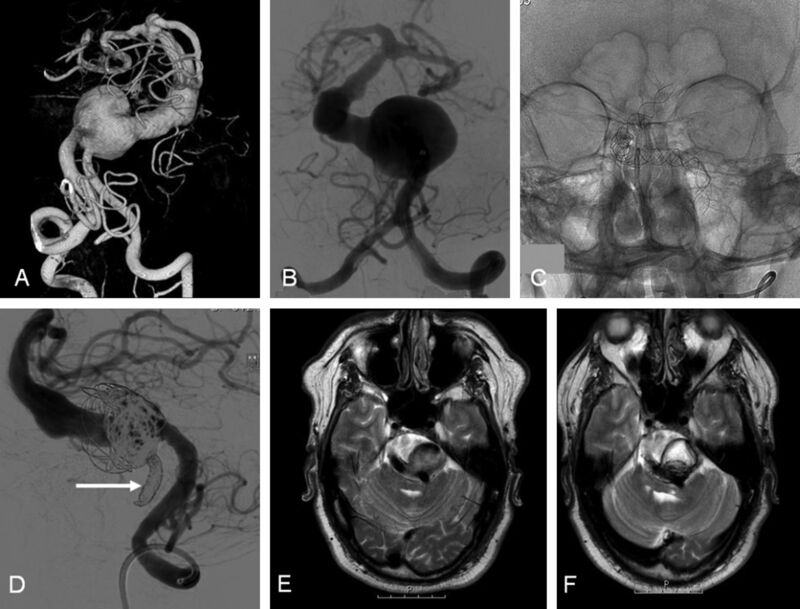 We describe the clinical presentation, radiologic features, and clinical outcome of 13 patients with fusiform basilar trunk aneurysms treated with flow diverters, stents, and coils. MATERIALS AND METHODS: Of the 13 patients, 7 were men and 6 were women with a mean age of 59.7 years. Clinical presentation was SAH in 3 patients, mass effect on the brain stem in 4 patients, vertebral artery dissection in 1 patient, and the aneurysm was an incidental finding in 5 patients. Mean aneurysm size was 21 mm. All except 1 were large or giant aneurysms. Nine aneurysms were partially thrombosed. RESULTS: Stents were used in all 13 patients, in 2 patients with additional flow diverters and in 11 patients with additional coils. In 4 patients, 1 vertebral artery was subsequently occluded with coils to decrease flow into the aneurysm. Of 13 patients, 9 had a good outcome with adequate aneurysm occlusion and stable size on follow-up of 6–72 months. One of 3 patients who presented with SAH died of a rebleed 1 month later. One other patient died soon after treatment of in-stent thrombosis, and another patient became mute after treatment. In 2 of 3 patients who presented with symptoms of mass effect, there was improvement at a follow-up of 6–24 months. CONCLUSIONS: Reconstructive endovascular therapy of fusiform and dissecting basilar trunk aneurysms is feasible but carries substantial risks. The safety and effectiveness in relation to natural history has not yet been elucidated. Modern endovascular techniques allow reconstructive therapy for fusiform basilar trunk aneurysms.6⇓⇓⇓⇓⇓⇓⇓–14 We describe the clinical presentation, radiologic features, and clinical outcome of 13 patients with basilar trunk aneurysms who were treated with flow diverters, stents, and coils. 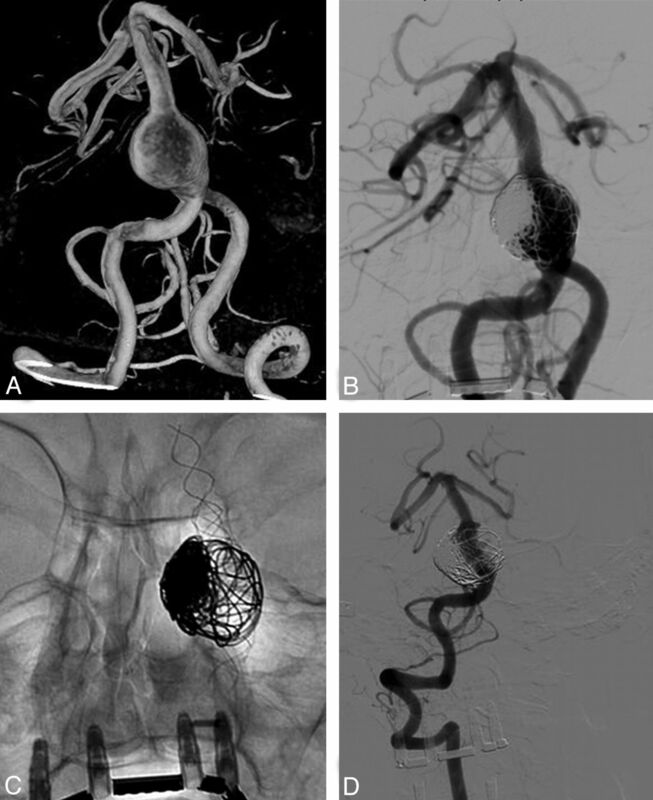 Between August 2005 and July 2011, thirteen patients with dissecting, fusiform, or dolichoectatic basilar trunk aneurysms were treated with reconstructive endovascular techniques by using coils, stents, and flow diverters. Patient and treatment characteristics are summarized in the On-line Table. There were 7 men and 6 women, with a mean age of 59.7 years (median, 61 years; range, 33–70 years). Clinical presentation was SAH in 3 patients, mass effect on the brain stem in 4 patients, posterior inferior cerebellar artery infarction following distal vertebral dissection in 1 patient; and in 5 patients, the aneurysm was an incidental finding on imaging studies for unrelated symptoms. Mean aneurysm size on cross-sectional imaging was 21 mm (median, 20 mm; range, 9–30 mm). Of 13 aneurysms, 11 were large or giant and 9 were partially thrombosed. Indications for treatment of patients with symptomatic and incidental basilar trunk aneurysms were discussed in a joint meeting with neurologists, neurosurgeons, and neuroradiologists. Treatment was tailored to the individual patient, accounting for various clinical and imaging parameters such as clinical presentation, patient age, the results of (serial) imaging, the presence of comorbidity, and patient preference. The choice of technique and the use of devices (stents, flow diverters, and coils) were dependent on anatomic geometry, size and length of the aneurysmal lumen, and the availability of devices. In the beginning of the study period, flow diverters were not yet available in our hospital. We preferred placing coils in the aneurysmal lumen after stent placement; when 2 good-caliber vertebral arteries were present, we preferred distal occlusion of 1 to decrease the flow into the aneurysm. Endovascular treatment was performed with the patient under general anesthesia and with systemic heparinization on a biplane angiographic unit (Allura Neuro; Philips Healthcare, Best, the Netherlands) equipped with 3DRA. Patients were preloaded with clopidogrel and aspirin. Angiography and 3DRA were performed through a single or bilateral vertebral artery contrast injection. Stable access to the basilar artery for stent placement was established with a 90-cm 6F introducer sheath (Destination; Terumo, Leuven, Belgium) positioned in the subclavian artery followed by insertion of a flexible 6F introducer catheter (Fargo; Balt, Montmorency, France) high in the vertebral artery, preferably in the V3 segment. In patients with 2 accessible vertebral arteries, a 5F introducer catheter was placed in the contralateral artery for control angiography and guidance of a second microcatheter if needed. From 3DRA images, the length and diameter of the stent were calculated by using standard machine software. For small stent sizes up to 4.5-mm vessel diameter and 32-mm length, an Enterprise stent was used (Codman, Raynham, Massachusetts), and for larger stent sizes, a LEO stent was used (Balt). Stents were telescopically placed in patients where long arterial segments needed to be bridged. In 2 patients, LEO stents were used as scaffolds to prevent shortening of telescopically placed Silk flow diverters (Balt). After stent placement, additional coils (Axium; ev3, Irvine, California) were inserted in the aneurysmal lumen in 12 of the 13 aneurysms, either via a microcatheter through the stent struts or via a previously jailed microcatheter. To further decrease the flow in the aneurysm in an attempt to promote luminal thrombosis, in 4 of 13 patients, we finally occluded 1 of the 2 vertebral arteries with coils in the V4 segment just proximal to the vertebral junction. After treatment, follow-up MR imaging or angiography was scheduled at 6–12 weeks. The clinical and radiologic results are summarized in the On-line Table. In all 13 patients, it was technically feasible to place the stents, flow diverters, and coils as intended. Complications of treatment occurred in 4 patients. Patient 3 (Fig 1) had a hemiparesis immediately after treatment and a brain stem infarction on MR imaging. Patient 4 experienced a myocardial infarction during general anesthesia, resulting in cardiac decompensation for which hospitalization of 4 weeks was necessary. Patient 7 did not wake up from general anesthesia, and repeat angiography demonstrated complete basilar thrombosis. Mechanical thrombectomy was successful, but the patient was brain dead and died the next day. Patient 10, who had a concomitant disseminated bile duct carcinoma, appeared mute following treatment. This condition remained until death from pulmonary embolism 3 weeks later. A 48-year-old man with intermittent dysphasia and dysarthria (patient 6). A and B, 3D and conventional frontal vertebral angiograms show a giant dolichoectatic fusiform aneurysm of the basilar artery. C, Two telescopically placed LEO stents are used as a scaffold for the flow diverter and coils. D, Lateral vertebral angiogram after a telescopically placed Silk flow diverter, coiling of the aneurysm lumen, and distal coil occlusion of the right vertebral artery (arrow). E, MR image before treatment shows a partially thrombosed aneurysm of the basilar artery with brain stem compression. F, MR imaging follow-up at 3 months demonstrates the thrombosed aneurysm with unchanged size. Of 13 patients, 9 (69%) had a good functional outcome (GOS 1–2) at a median follow-up of 12 months (mean, 18; range, 6–72 months). One patient (patient 2, 8%) who presented with SAH in poor clinical condition is dependent in a nursing home after 24 months. Three patients (23%) died shortly after treatment: Patient 3 died 4 weeks after treatment of a recurrent SAH despite adequate occlusion of the aneurysm with coils; patient 7 died directly after treatment from in-stent basilar thrombosis; and patient 10, who was mute since treatment, died 3 weeks later of a pulmonary embolism. Of 3 surviving patients who presented with symptoms of mass effect on the brain stem, 2 improved neurologically and 1 was unchanged. A 48-year-old man presented with intermittent dysphasia and dysarthria (Fig 1). On MR imaging, a large and partially thrombosed basilar trunk aneurysm with brain stem compression was apparent. 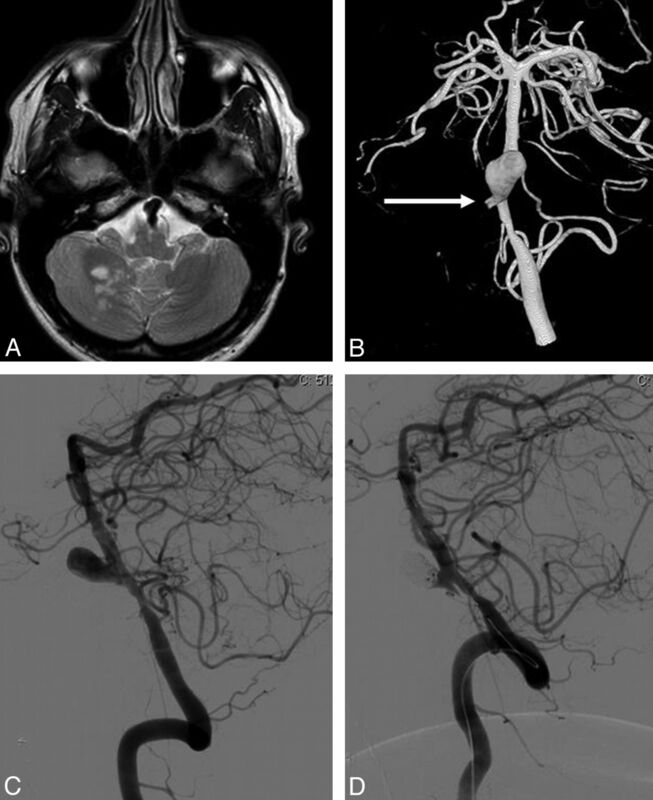 Angiography showed a giant fusiform dolichoectatic proximal basilar aneurysm. The aneurysm was treated with a Silk flow diverter telescopically placed in 2 overlapping LEO stents. The aneurysmal lumen was occluded with coils, and finally, the right vertebral artery was occluded with coils to decrease inflow in the basilar system. MR imaging follow-up at 3 months showed complete thrombosis of the aneurysm with unchanged aneurysm size. Clinically, there was no improvement of the brain stem symptoms. 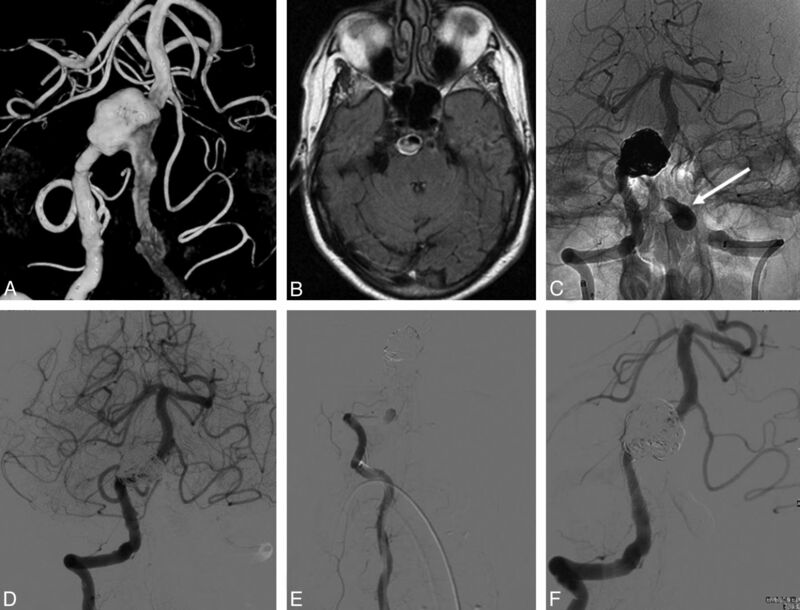 A 33-year-old man presented with a dissection of the right vertebral artery, resulting in a PICA infarction, an occlusion of the V4 segment of the right vertebral artery, and a large dissecting lower basilar aneurysm (Fig 2). Because the distal part of the left vertebral artery was narrowed, apparently the dissection extended over the vertebral junction into the opposite left V4 segment. The dissecting basilar aneurysm was completely occluded with coils after stent placement over the aneurysm neck and the dissected and narrowed V4 segment of the left vertebral artery. Follow-up angiography at 14 months showed stable complete occlusion of the aneurysm. The patient made an uneventful clinical recovery. A 33-year-old man with a dissection and occlusion of the right vertebral artery, resulting in a PICA infarction (patient 8). A, MR image shows partial right PICA infarction and a proximal basilar dissecting aneurysm. B, 3D angiogram in a frontal view demonstrates a large dissecting proximal basilar aneurysm with occlusion of the distal right vertebral artery (arrow indicates the stump) and narrowing of the distal right vertebral artery. C and D, Lateral view of a left vertebral angiogram before (C) and after (D) stent placement and coiling of the dissecting aneurysm. 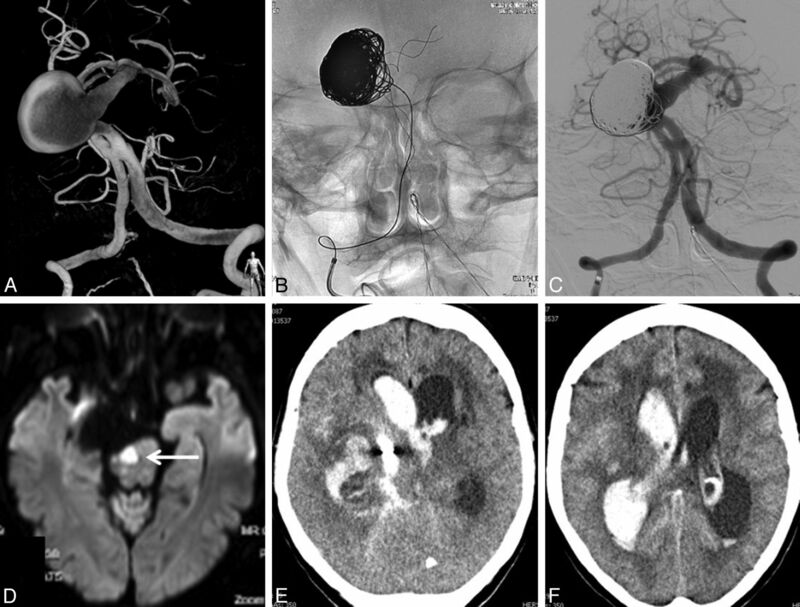 A 65-year-old woman had a transient ischemic attack; on CT, a partially thrombosed fusiform basilar trunk aneurysm was found incidentally (Fig 3). Angiography showed a large proximal fusiform basilar aneurysm in an ectatic vertebrobasilar system. The aneurysm was bridged with 3 telescopically placed LEO stents from the distal basilar artery into the distal right vertebral artery. Subsequently, the aneurysmal lumen was partially occluded with coils. Follow-up angiography at 6 months and 1 year showed progressive thrombosis of the aneurysm. Aneurysm size was unchanged at MR imaging. Clinically, she was asymptomatic. A 65-year-old woman with an incidentally found partially thrombosed fusiform basilar trunk aneurysm (patient 12). A, 3D angiogram shows a giant dolichoectatic fusiform aneurysm of the basilar trunk. B and C, Angiography after 3 telescopically placed LEO stents and coiling of the aneurysm lumen. D, Follow-up angiogram at 12 months shows complete occlusion of the fusiform aneurysm. A 70 -year-old woman presented with an SAH of Hunt and Hess grade III. CT angiography showed a giant aneurysm on the basilar artery (Fig 4). Angiography confirmed the presence of a giant aneurysm on an ectatic and elongated basilar trunk, just distal to a proximal basilar fenestration. Three days later, a LEO stent was placed via the right vertebral artery in the basilar trunk across the aneurysmal neck. Subsequently, 1130 cm of coils was inserted in the aneurysmal lumen, and the aneurysm appeared adequately occluded. Several hours later, the patient developed a right-sided hemiplegia. MR imaging the next day showed a brain stem infarction and a small cerebellar infarction on the right side. The patient gradually neurologically improved and was discharged home 2 weeks later. Four weeks after treatment, she was found comatose at home, and a CT scan revealed a recurrent SAH. She died the next day. A 70-year-old woman presenting with SAH (patient 3). A, 3D angiography shows a giant dolichoectatic aneurysm of the basilar trunk with a proximal fenestration. B and C, Adequate coil occlusion of the aneurysm after stent placement. D, Diffusion MR imaging the next day performed for sudden hemiparesis shows a brain stem infarction. E and F, Massive recurrent SAH 1 month after endovascular treatment. A 64-year-old man presented with abducens paresis. MR imaging showed a large dolichoectatic partially thrombosed proximal basilar aneurysm (Fig 5). Angiography demonstrated the aneurysmal lumen and irregular and ectatic distal vertebral arteries. After telescopic placement of 2 LEO stents from the distal basilar artery into the right vertebral artery, a Silk flow diverter was inserted, the aneurysm lumen was filled with coils, and the left vertebral artery was occluded with a detachable balloon in the V4 segment. After embolization, the patient did not wake up from general anesthesia, and repeated right vertebral angiography showed in-stent thrombosis in the V4 segment. Mechanical thrombectomy was performed resulting in recanalization of the basilar artery, but with persistent occlusion of the right posterior cerebral artery. The clinical condition did not improve, and brain death was established. The patient died the same day. A 64-year-old man with abducens paresis (patient 7). A and B, 3D angiography and MR imaging demonstrate a large dolichoectatic partially thrombosed basilar trunk aneurysm. Note irregular and ectatic distal vertebral arteries. C and D, Right vertebral angiography after telescopic placement of 2 LEO stents and a Silk flow diverter, coiling of the aneurysm lumen, and balloon occlusion of the left vertebral artery in the V4 segment (arrow in C). E, After embolization, the patient did not wake up from general anesthesia. Repeated right vertebral angiography shows in-stent thrombosis in the V4 segment. F, Recanalization of the basilar artery after mechanical thrombectomy but with persistent occlusion of the right posterior cerebral artery. The patient died the same day. We found that with modern endovascular techniques and devices, reconstructive treatment of large and giant dolichoectatic and dissecting basilar trunk aneurysms is feasible. Conventional stents with sufficiently large diameters can be placed telescopically to negotiate long dilated and ectatic vessel segments and to serve as a scaffold for additional telescopically inserted flow diverters and/or coils in the remaining aneurysmal lumen. Long-term effects or benefits of reconstructive endovascular treatment are not yet completely understood. So far, the complication rate of reconstructive treatment of fusiform vertebrobasilar artery aneurysms seems particularly high in symptomatic patients, while the outcome of treatment in patients with incidentally discovered aneurysms appears rather good. These findings would suggest that treatment should be offered in asymptomatic patients, especially when serial imaging indicates growth of the fusiform aneurysm. In patients presenting with (progressive) mass effect on the brain stem, treatment may be offered despite the risk of complications because the natural history is very poor. In patients presenting with subarachnoid hemorrhage, treatment is indicated in view of the high chance of recurrent hemorrhage. Patients with large fusiform dolichoectatic and dissecting aneurysms of the basilar trunk are clinically challenging. The natural history is poor, especially when the aneurysm is symptomatic by mass effect or SAH. Therefore, reconstructive endovascular treatment may be offered in both symptomatic and asymptomatic patients, despite the substantial procedural risk and uncertain clinical benefit in the long term. More data are needed to elucidate the many clinical dilemmas involved in this patient group. Disclosures: Willem Jan van Rooij—UNRELATED: Grants/Grants Pending: Vertebroplasty for Painful Acute Osteoporotic Vertebral Fractures IV. * *Money paid to the institution. Accepted after revision May 29, 2012.